They were designed as windows unto the heavens adorned with images of the afterlife and the myths and stories of the Christian faith. However medieval designers of stained glass windows did not realise they also had equipped their houses of worship with a high tech air filtering system. It seems that it’s not just seeing the light in church that matters it’s standing in it and allowing the rays to bathe you. 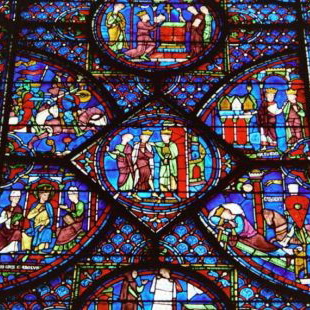 Australian scientists have discovered that European stained glass windows have powers that are scientific not only spiritual. In 2008 a group of researchers from the Queensland University of Technology (QUT) found that microscopic gold nanoparticles, small enough to pass through human cells, when exposed to sunlight reveal interesting new properties. Gold pink glass is known to be the most expensive glass we can buy but what a surprise to find that associate Professor Zhu Huai Yong, from QUT’s School of Physical and Chemical Sciences, says that gold’s ability to act as a catalyst to speed up chemical reactions, worked in the ornate church windows to strip the air of dangerous chemicals! 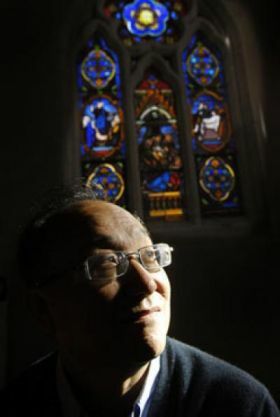 “For centuries”, Professor Zhu says, “people appreciated only the beautiful works of art and long life of the colours, but little did they realise that they are also, in modern language, photocatalytic air purifiers with nano structured gold catalysts. “When people use gold as a catalyst in a reaction they need an energy input to heat it up 100 or 200 degrees Celsius … but when the particles (of gold) show colour they get the energy for the reaction from sunlight already,” Professor Zhu said. “The electromagnetic field of the sunlight can couple with the oscillations of the electrons in the gold particles and creates a resonance. These pollutants are known as Volatile Organic Compounds(VOC) and are found in new furniture, carpets and paint and give that distinctive ‘new’ smell as they slowly leach from the products and can be harmful even in small amounts. “You smell a chemical smell, it’s not good for your health,” Professor Zhu said. The by product of the chemical reaction with the gold nanoparticles is small quantities of carbon dioxide, which the researchers say is much safer compared to the pollutants. Perhaps when designing our stained glass windows we should be bearing this in mind and creating works of art which are not only beautiful but possibly life saving! https://abinger-stained-glass.co.uk/wp-content/uploads/2010/10/800px-cathedral-chartres-2006_stained-glass-window_detail_01-4.jpg 310 310 Amanda Winfield /wp-content/uploads/2016/02/logo-main.png Amanda Winfield2010-10-03 08:33:002016-11-23 15:51:45Life Saving Light? Error: Error validating access token: Session has expired on Monday, 08-Apr-19 03:56:55 PDT. The current time is Friday, 19-Apr-19 11:41:38 PDT.